For other ships with the same name, see RMS St Helena. RMS St Helena, was a cargo liner (carrying cargo and passengers) that served the British overseas territory of Saint Helena. She sailed between Cape Town and Saint Helena with regular shuttles continuing to Ascension Island. Some voyages also served Walvis Bay en route to/from, or occasionally instead of, Cape Town. She visited Portland, Dorset twice a year with normal calls in the Spanish ports of Vigo (northbound) and Tenerife (southbound) until 14 October 2011, when she set sail on her final voyage from the English port. On 10 February 2018 she departed for her last trip from St Helena to Cape Town. At the time of her retirement from St Helena service she was one of only four ships in the world still carrying the status of Royal Mail Ship. Locals including local press have usually called her the RMS, in order not to confuse her with the island itself. In April 2018 she was purchased by MNG Maritime and renamed MNG Tahiti to act as a vessel based armoury (VBA) licensed by the UK Department for International Trade (DIT) in the Gulf of Oman. In October 2018 MNG sold the ship and she returned to the UK renamed St Helena once more. Formerly, Saint Helena island was occasionally served by ships of the Union-Castle Line, which ran between the UK and South Africa. By the 1970s the number of ships taking this route had declined significantly and Union-Castle withdrew from the route completely at the end of 1977. As Saint Helena lacked an airfield, the British government had to purchase a ship to service the remote island and its dependencies from Cape Town. 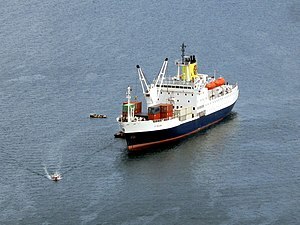 The British government purchased the part passenger, part cargo ship Northland Prince to fulfil the role of servicing Saint Helena, and after being refitted and renamed this became the first RMS St Helena. Originally built in 1963, this converted 3,150 ton ship had room to carry 76 passengers and supplies. The ship was used by the Royal Navy during the Falklands War as a minesweeper support ship. By the 1980s it was becoming apparent that the ship was too small for the island's needs, resulting in the new St Helena, built in 1989. The island lacks a port suitable for large ships, so the RMS anchored near the island, and loaded and unloaded cargo to and from lighters. The new RMS St Helena was built by Hall, Russell & Company in Aberdeen, and entered service in 1990. St Helena was a British registered Class 1 passenger/cargo ship, and operated with 56 officers and crew. St Helena was equipped to carry a wide range of cargo, including liquids, to meet the needs of the population of Saint Helena. She also had berths for 155 passengers and associated facilities including a swimming pool, shop, and lounges. She also had well-equipped medical facilities and an on-board doctor. The ship's capacity was extended in 2012 by the addition of 24 extra cabin berths, and a new gym was installed. When she converted to a vessel based armoury, in May 2018, a rigid inflatable boat davit was fitted on the port side, and additional bunks installed, taking the capacity to 30 crew and 250 passengers (security guards). In November 1999 St Helena broke down en route to the island and was forced into the French port of Brest to undergo repairs. Many people were left stranded on the island with no way in or out whilst the ship was being repaired. Panic ensued as islanders became concerned about the non-delivery of vital supplies. This incident intensified calls for the island to be provided with an airport. On 25 August 2000, St Helena suffered a minor engine room fire while sailing from Cardiff to Tenerife on the first leg of her journey to the island. No one was injured and there was no significant damage. In 2005 the British government announced plans to construct an airport on Saint Helena, which was initially expected to be operational by 2010, which would lead to the withdrawal from service of the RMS St Helena. This project was paused though, until in October 2011 approval of the project was announced, with work commencing in 2012. The estimated cost on the project is £240 million and the airport was due to open in the first quarter of 2016. However, due to concerns about wind shear, on 26 April 2016 the St. Helena Government announced an indefinite postponement to the opening of Saint Helena Airport. RMS St Helena had been placed for disposal via London shipbrokers CW Kellock, but was subsequently restored to service. The voyage originally intended as her final one began on 14 June 2016 from the UK and ended on 15 July in Cape Town, calling at Tenerife, Ascension Island and St Helena. As part of its farewell voyage, Royal Mail organised a letter exchange with pupils from Cardiff and St Helena. However, due to the postponed opening of the airport, the schedule of RMS St Helena was extended as an interim measure. The ship was initially scheduled to run until July 2017, and then February 2018. After the opening of Saint Helena Airport to scheduled passenger flights on 14 October 2017, RMS St Helena was withdrawn from service, and her last sailing from St Helena Island was on 10 February 2018. Freight services for the Saint Helena island have been taken over by the MV Helena cargo ship, and mail and other express freight by the passenger aircraft. In April 2018, she was purchased by MNG Maritime and entered service as a vessel-based armoury in the Gulf of Oman named MNG Tahiti to supply weaponry to ships travelling through the High Risk Area of heightened pirate activity in the Indian Ocean. In October 2018 the vessel was resold to St Helena LLC, Jersey and in 2019 the ship will be refitted to act as a mobile hub for the each race event of the Extreme E electric SUV racing series. ^ "RMS Specifications". Web.archive.org. 27 December 2009. Archived from the original on 27 December 2009. Retrieved 11 September 2015. ^ "RMS St Helena sets sail for final time | News". Wanderlust. 14 October 2011. Archived from the original on 9 April 2016. Retrieved 11 September 2015. ^ "RMS St Helena - Two remarkable ships: 1978-2018". Saint Helena Island Info. Retrieved 13 June 2018. ^ "Life on Board". Royal Mail Ship St Helena. Retrieved 12 June 2018. ^ "Africa | Give us an airport, say islanders". BBC News. 10 November 1999. Retrieved 11 September 2015. ^ "Fire in engine room of passenger vessel RMS St Helena Marine Accident Investigation Branch report - GOV.UK". Maib.gov.uk. 25 August 2000. Retrieved 11 September 2015. ^ "RMS St Helena to make last voyage - Travel News | IOL Travel". Iol.co.za. 9 May 2015. Retrieved 11 September 2015. ^ "Final Voyages". RMS St Helena. Archived from the original on 24 August 2015. Retrieved 19 June 2016. ^ "RMS St Helena says farewell to UK for last time". ITV News. 14 June 2016. Retrieved 19 June 2016. ^ "Royal Mail marks farewell voyage of RMS St Helena". 500years.royalmailgroup.com. 13 June 2016. Retrieved 19 June 2016. ^ "Maintaining access to St Helena & Ascension". St Helena Government. 3 June 2016. Retrieved 2 July 2016. ^ August Graham (14 July 2016). "RMS Extended to July" (PDF). The Sentinel. p. 2. Retrieved 6 August 2016. ^ "RMS Sailing Schedule extended until February 2018". 15 December 2016. Retrieved 14 January 2017. ^ Staff, CIN (5 February 2018). "RMS St Helena Set for Final Voyage". Retrieved 5 February 2018. ^ "RMS St Helena Withdrawing from Service". World Maritime News. Retrieved 6 October 2017. ^ "Flights to remote St Helena begin at last". BBC News. 14 October 2017. Retrieved 14 October 2017. ^ "RMS St. Helena to Return as Anti-piracy Armory Vessel". Marine Link. 17 April 2018. Retrieved 19 April 2018. ^ "St Helena (8716306)". Equasis. French Ministry for Transport. Retrieved 6 March 2019. ^ Kalinauckas, Alex (31 January 2019). "Extreme E unveils full series concept ahead of 2021 launch". Autosport. Richmond, Surrey. Retrieved 6 March 2019. Bryant, John (2016). RMS St Helena: Royal Mail Ship Extraordinary. Ramsey, Isle of Man: Ferry Publications. ISBN 9781911268024. Cookson, Ted (2004). A diary of the final cruise of the RMS St. Helena to Tristan da Cunha, January 15-28, 2004. Greenville, Maine: Moosehead Communications. ISBN 1890454281. Wikimedia Commons has media related to St Helena (ship, 1990). This page was last edited on 6 March 2019, at 13:12 (UTC).